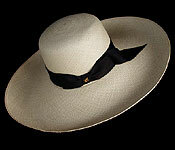 You’ve probably never worn a hat with a brim as wide as these. I really enjoyed testing this style by showing it to women friends. The usual reaction was to shriek, grab the hat, and run for the mirror. Now I’ll be the first to admit that I know nothing about women. (Okay, okay, maybe less than that.) But I figured the shriek-and-mirror reaction meant it was a winner. Apparently, there is something very comforting about a hat with a 7-inch brim. Several said they felt like they just wanted to get under there and wrap themselves in it like a security blanket. I have no idea what your reaction will be when it emerges from the shipping box. You may let out a cry of joy and run for the mirror. You may head for the beach. You may head off to some elegant affair, knowing you will be noticed. I have these custom woven for me. As usual, I requested a much higher than average weave quality, natural straw. I finish them with black grosgrain ribbon outside. Taller crowns get wider ribbon, shorter crowns get less wide ribbon. You can turn the brim up all around. Turn it down in front. Turn it down in back. Turn one side down, one side up. You may decide to pin up one side. Or the other. One hat, many styles. One woman, many moods. The young ladies in the photographs are not at all overwhelmed by that much brim. The woman pictured above is no more than 4’10” and as thin as my patience at the end of a long day. It amounts to unabashed self-indulgence. Cotton Twill is the standard sweatband. Black 1 ½ inches is the standard ribbon.